Why does our baby need this pillow? Newborns need not only the right amount of sleep but also a high quality of sleep. If your infant's head is not positioned correctly it could disturb his or her sleep, keeping his or her brain and body from growing as fast and healthy as it should. Our pillow puts your infant into an ergonomically correct position, keeping his or her head aligned with the spine. It is in this position that air flow is optimum and that the best sleep is achieved. A baby that has high quality restful sleep is a happy, healthy, and thriving baby. Why should you choose "New Zeal" pillow? Our Newborn Head Shaping Pillows cradles your baby's head to encourage natural round growth while keeping them comfortable, and allowing them better quality sleep. CUSTOMER FEEDBACK:Our clients used to say that "new zeal" pillow the neck part is thinner and softer than the rest of the pillow which is an important factor in using a pillow for babies.This is more suitable for babies after 3 months, because it is a little bigger than the average newborn pillow. After 3 months, the baby starts to turn over. This pillow is more effective in protecting the baby's skull. The World Health Organization recommends laying the baby down on its back to reduce the risk of sudden death syndrome. Positioned on its back, the infant's face is free to breathe without constraint. 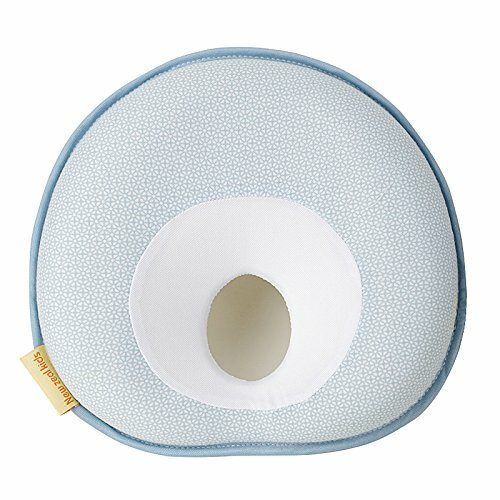 HELPS YOUR BABY SLEEP IN PROPER POSITION - The head pillow is designed to allow better airflow on the neck which leads to better quality of sleep. The pillow is very soft, thus providing the amazing comfort your baby needs while still supplying the necessary support to keep your infant's head in alignment to the spine. ASSISTS IN HEALTHY INFANT DEVELOPMENT - Our clients used to say that "new zeal" pillow the neck part is thinner and softer than the rest of the pillow which is an important factor in using a pillow for babies.This is more suitable for babies after 3 months, because it is a little bigger than the average newborn pillow. After 3 months, the baby starts to turn over. This pillow is more effective in protecting the baby's skull. DESIGNED WITH BABY'S COMFORT IN MIND - The baby pillow is made of hypoallergenic and bacteria-resistant memory foam that's covered with 100% soft, organic, and breathable cotton. Made with premium materials, it helps your baby achieve a more revitalizing sleep. VENTILATION DESIGN:memory foam covered with soft, luxurious, breathable cotton fabric, provides style and comfort,it's very convenient for on-the-go parents as it can be used as an insert for bassinets, infant car seats, swings, bouncer, strollers, cradles, and more. New zeal 's baby pillow is very travel-friendly! LIFETIME WARRANTY: New zeal is commited to quality, safety and 100% consumer satisfaction, so all of our products are backed by a lifetime warranty. If you have any questions about this product by New zeal, contact us by completing and submitting the form below. If you are looking for a specif part number, please include it with your message.